Ocean Park is located in the Torviscas area of Costa Adeje in Tenerife. It is close to all the best amenities - restaurants, bars, shops, entertainment, seafront etc. and yet it retains a quiet relaxed ambience. The entrance to the complex 20m down a quiet barriered road off the main thoroughfare. The seafront area is 10 minutes walk using almost entirely pedestrian routes and the modern San Eugenio shopping mall is even closer. The highly recommended aquapark is also a 15 minutes walk away. 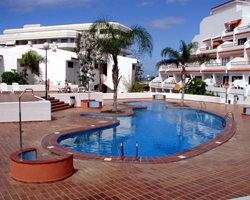 There is a swimming pool with surrounding sun terraces and sun loungers. There is also a pool bar/restaurant ADMIRALS, with British hosts and HERNANDEZ music/food bar next to good supermarket. Ocean Park should not be confused with Ocean View which is up the hill and far to walk! Tenerife offers sunshine all year round with day temperatures ranging from 20 degrees C in winter to 30 degrees C in summer months. However, most times it is 25 degrees C.
Local activities include: swimming, tennis, fishing, wind-surfing, water skiing, paragliding, aquapark etc.